I can't believe its Wednesday already! Time is flying by and tomorrow is already March 1st. This makes me happy because it means daylight savings time is near which means BRIGHTER days and closer to SPRING. I can't wait to throw my sock drawer into retirement and rock the sandals on a daily basis, that IS the life. I hope you're all having a good week of eating as I am currently making up for my big NO NO meal I had on Saturday. I don't even want to say it, but I caved in and had MCDONALD'S. A McChicken combo. It tasted amazing at the time but my tummy was paying for it the next day. That being said, it was like 6 to 7 months with no McDonald's so I don't feel that bad. My breakfast this week has been smoothies! One banana, a few tbsp of vanilla greek yogurt, 1 tsp of PB, 1 tsp of cocoa powder, almond milk, hemp seeds and a dash of cinnamon...I like to call it dessert for breakfast. My morning snack today was a blood orange. I forgot how good these are! So juicy and flavourful. Lunch has been great this week! I had this really amazing chicken curry from Veda and a SUPER salad containing glass noodles, snap peas, pom seeds, coleslaw, rapini, asparagus, broccoli and tossed with olive oil....SO GOOD. My afternoon snack consisted of healthy cookies at a sampling party hosted by moi in one of the empty offices during lunch hour. 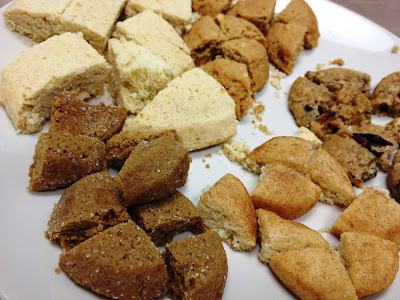 I invited a few of the girls I work with to come and try out some of the wonderful cookies I've received from New Moon Kitchen and WOW Baking. Both full reviews to come! After work I went to the gym and tried out one of the new classes called Body Shred created by Jilian Michaels. The description is: Rev your metabolism with Jillian’s 3-2-1 interval/circuit training approach – it will have you burning fat and extra calories for days! All packed into an intense 30-minute workout! For an after dinner snack I had one of my raw tarts! 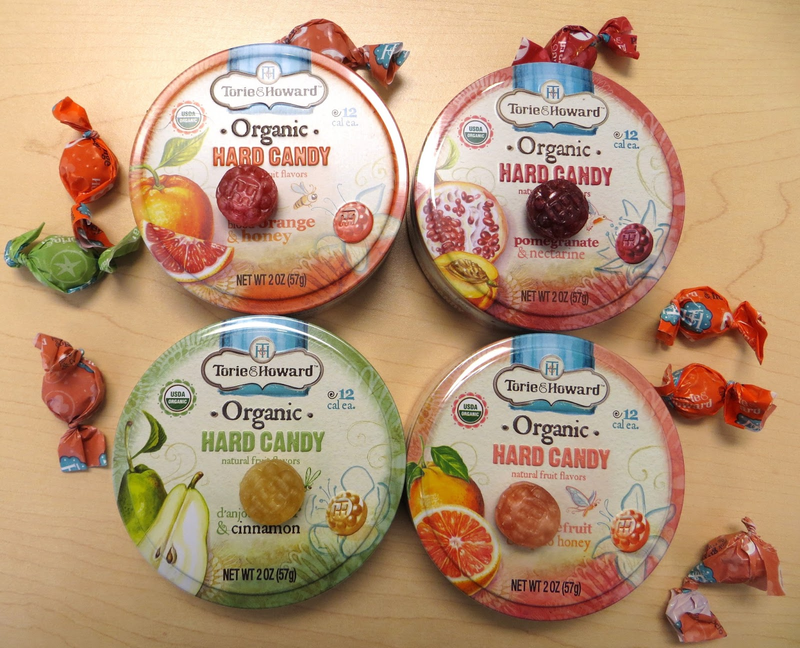 Don't forget to enter MY blog giveaway for Torie and Howard Organic Candies!! Hi all! Are you candy fans? I have always been a candy fanatic and enjoy gummy bears, skittles, sour patch kids etc. Clearly they are not the best thing to snack on but sometimes I just have a real craving for them. I was lucky to find a company that actually makes organic hard candies with magnificent flavours; Torie and Howard bring you all natural satisfaction in the form of a small flavourful candy that has only 12 calories per sweet! Owner’s Torie and Howard actually became business partners through interior design projects as Howard is an Interior Designer and Torie a Colour Consultant. After working on some impressive design projects, both Torie and Howard faced some health related events that significantly impacted their life. They both had a renewed focus on improving their lifestyles with healthy, nutritious changes on their mind. Howard lost over 100 lbs and his lifestyle transformed drastically as he made sure that every single calorie consumed was beneficial but still tasty and satisfying. Torie developed severe food allergies that forced her to change her eating habits and seek healthier snack options so that she could cope. Both their dedication to health and nutrition in their lives led them to developing their own snack food company. Torie & Howard was born, all out of the love and devotion to achieving all natural and flavourful snacking for healthy foodies alike. Their hard organic candies come in versatile and unique flavours that make your palette squirm. 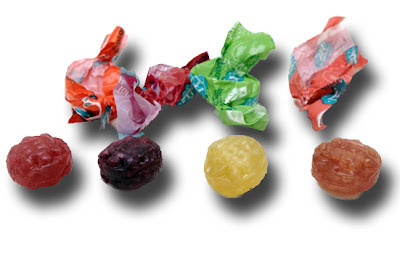 There are no additives, artificial flavours or colours in these candies! The flavours are: Blood Orange & Honey, Pink Grapefruit & Tupelo Honey, Pomegranate & Nectarine and d’Anjou Pear and Cinnamon. Their candies are actually flavoured with red cabbage, purple carrots, organic black carrot, organic blackcurrant and organic apple! Of all the flavours, Pomegranate and Nectarine is my favourite. The flavours are very authentic tasting and are both tart and sweet. If I am craving sweets, I just pop one of these in my mouth. Next favourite is Grapefruit, third blood orange, and lastly the cinnamon pear which unfortunately I am not much of a fan of because of the cinnamon flavouring. The kind folks at Torie & Howard has sent me some generous samples to give away! One lucky winner will win one tin of each flavour! Aren't these so cute? Enter below through rafflecopter. Contest is open to Canadian and US residents only. So right after I made the lovely cashew cream and realized I need this cream in my life at all times, I made some vegan tarts for this cream to dwell in and for me to devour . These tarts are seriously so easy to make and the outcome is actually incredible. It’s the flavour of the tart shell with the creamy goodness of the cashew and the sweetness of the fruit that make these irresistible. I kept taking small bites of the tart and thinking how is there no added sugar in this, it felt super good eating a tart that fulfilled my sweet-tooth craving but was raw and HEALTHY and full of good fats, fibre and protein. 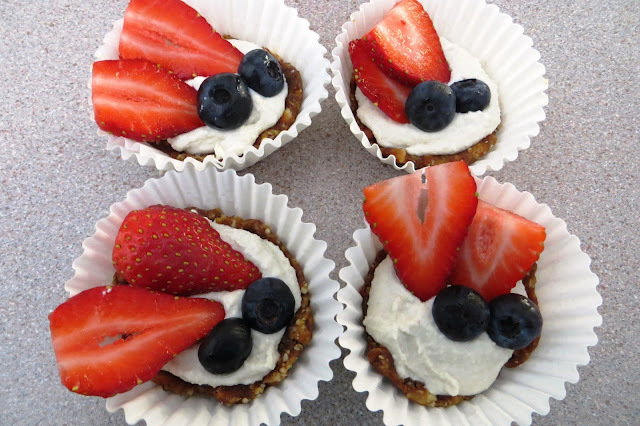 Not only are these tarts good for you, but they are CUTE and who doesn't like a cute dessert? These could be dressed up for any occasion! Maybe some cranberries and mint leaves for Christmas or strawberry hearts for Valentine's; be creative! I knew these tarts would be a hit after getting the approval of my sister’s boyfriend who really isn't a fan of anything healthy haha. I was sure he would take a bite and be like thanks but no thanks but he ate the whole tart. I’m pretty sure my sister and I had a look of disbelief on our faces the whole time. 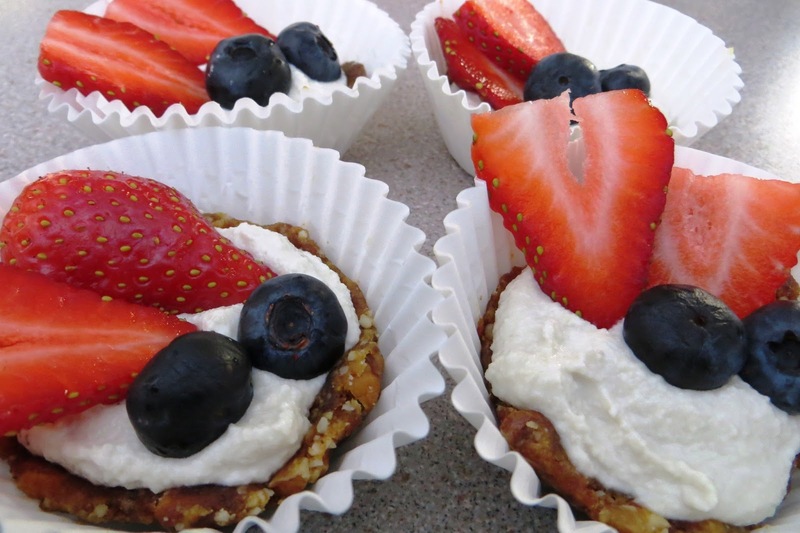 I can’t wait to make these tarts again for potlucks and gatherings. They are simple to make and a great conversation piece as many people won’t even realize that they are eating a vegan dessert. I can't wait to try out more raw dessert recipes, so much fun! Throw the whole dates, ground almond and pecans in a food processor and pulse until mixture is chopped and crumbly. I actually didn't have a food processor on hand and ended up chopping the dates/pecans up with a knife and it worked out well, just more time consuming. Using your hands, form 7 to 8 evenly sized balls of the date mixture. 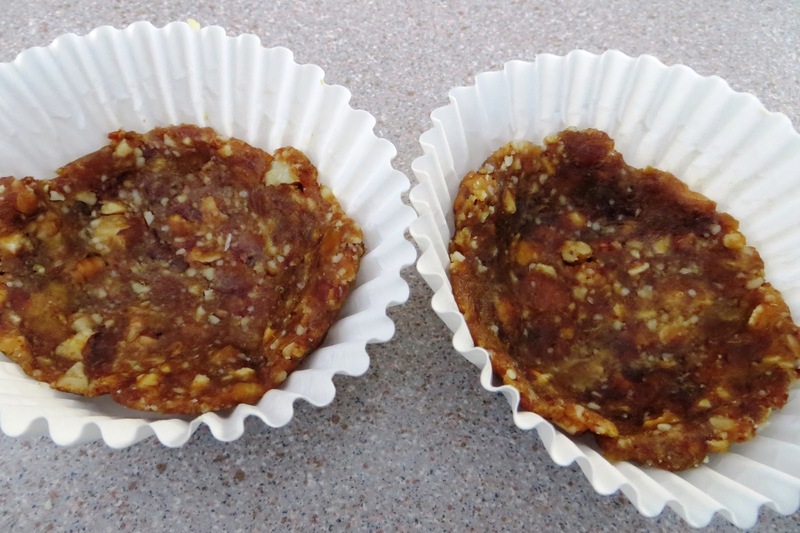 Wet hands slightly and flatten out each ball and press firmly into muffin liner or tart tin. Fill each tart with a dollop of cashew cream and then top with berries. Place in the fridge for 1 to 2 hours before serving. Hi all! I recently discovered a lot of recipes for raw desserts and have been quite intrigued by the many varieties out there. A lot of the recipes actually look a lot more appealing than the processed and evidently unhealthier stuff that most people make. I am by no means vegan, but I don’t eat a lot of red meat and try to embrace a vegetarian diet a few days of the week. I have been looking at a lot of recipes on Pinterest that are raw and vegan and majority of the ones I came across actually sound incredible. There are so many creative ways to use raw ingredients to develop a tasty and wholesome dessert that embodies purity and flavour. During my raw dessert research, I was super excited to receive an email from Hannah over at BitterSweet telling me that I've won the Raw Dessert cookbook from a contest she recently hosted. I thought to myself what perfect timing, I’m going to become a raw dessert freak now! I can’t wait to try out some of the recipes from the book and all of the other ones I have pinned away. 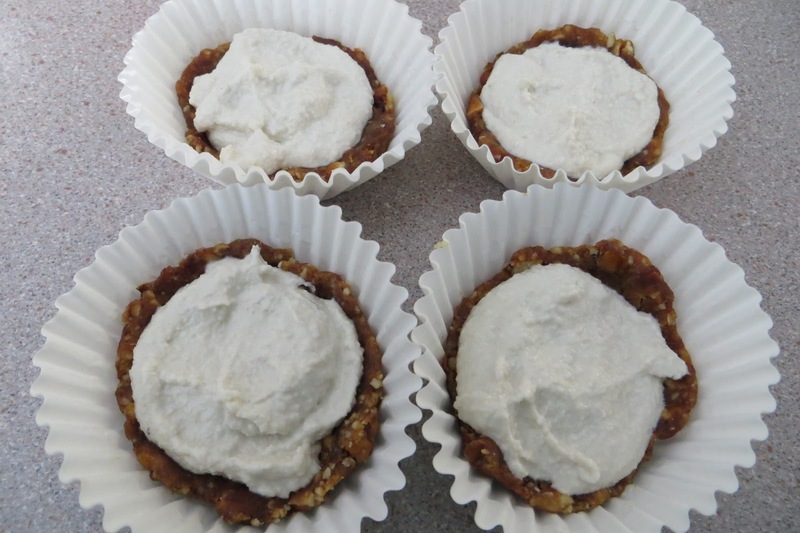 Since I have such a sweet tooth, the most perfect guilt-free way to satisfy it is by making some of the raw treats that I know are full of wholesome foods and natural flavour. I won’t forever be a raw dessert girl because I really do enjoy a slab of frosted chocolate cake from time to time, but if I can get used to making most desserts this way than that’s a step in the right direction and a huge success for me. 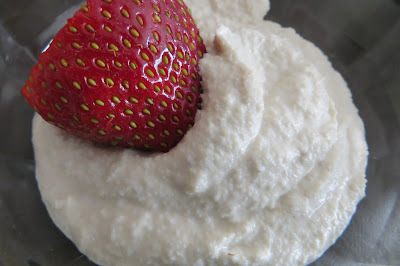 Cashew Cream was the first raw vegan dairy-substitute I came across and I immediately was enticed by it. The next morning after discovering the recipe, I picked up a bag of raw cashews from the bulk barn and soaked them over night. In the morning I followed the recipe I found with a minor modification and was amazed at how easily this cream came together. 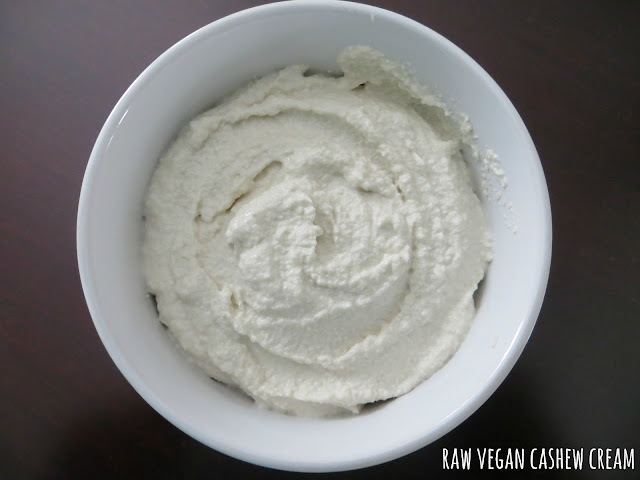 The cashews had softened so much that my cheapo blender whipped up this creamy mixture in no time; I was impressed. I took a spoonful of this and dug right in. Such a soft and creamy texture had developed and it was similar to a whipped cream but less thick. 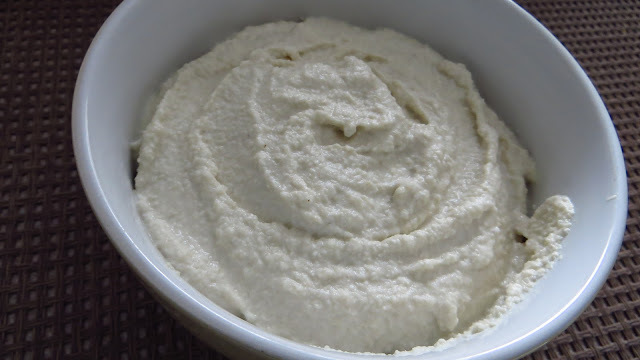 I can’t even really say what cashew cream tastes like because the flavour is very mild. I for one have never ate a raw cashew until this recipe was found and they actually taste a lot different than a roasted cashew. 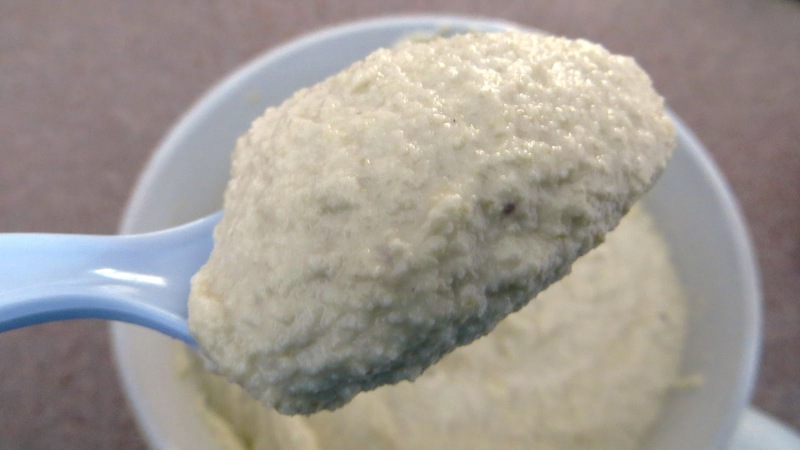 They are much creamier and mild in flavour and so that’s basically what this cashew cream tastes like. The vanilla and coconut almond milk gave it a hint of flavour too. I started to eat this right away with a bowl of strawberries and the combo was perfect, I literally didn't give a crap about real whipped cream at this point, the cashew cream was SO satisfying! 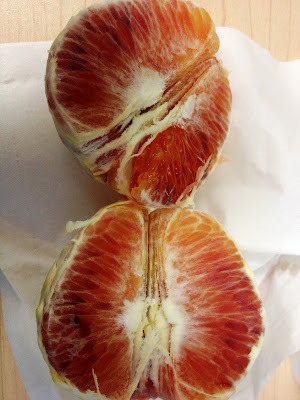 I was so happy that I found such an amazing recipe that I wanted to add it to another raw recipe. 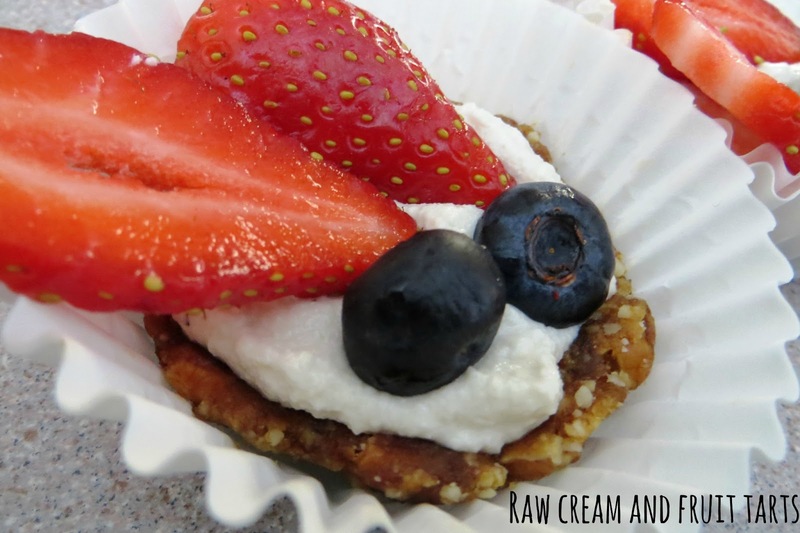 My sister and I thought about making some raw tarts and came up with an easy crust within 10 minutes. We refrigerated them for a few hours and then dug in. Seriously amazing! My whole family loved them including my sister’s boyfriend who is a 'I eat junk food' kind of guy, he was really surprised at how good these tasted. If you want to use this as a dairy substitute in pasta sauces and other dishes, just omit the vanilla, almond milk, agave and use filtered water instead. Throw everything into the blender and puree until thick and creamy. It is a good idea to start with ¼ cup of water, and then gradually thin it out in order to achieve the desired thickness. Hi Everyone! 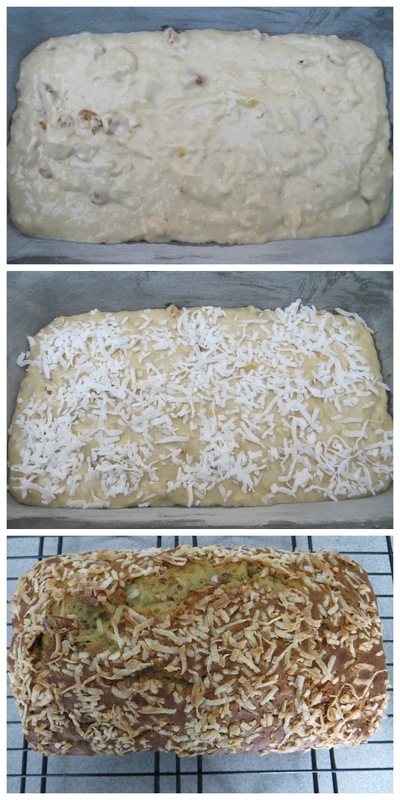 As promised, I am posting the delicious coconut banana bread recipe I made this past weekend. I always end up having overripe bananas in the kitchen and my favourite way to use them is in banana bread or banana chocolate chip muffins. I usually make a recipe my mom gave me but its definitely not the healthiest banana bread recipe out there. However, I also don’t want a banana bread recipe that is overly healthy and tastes like cardboard. Luckily this one is right smack in the middle and is DELICIOUS, moist and quite nutritious! There is no butter in this recipe and instead of using whole eggs; you’ll only need the whites. I added walnuts to the recipe for added protein and well because I feel like banana bread is lost without some sort of nut in it, does that make me a nut for thinking this way? I hope NUT. Yep, I fully admit I’m a nerd. One of the best things about baking banana bread is the exquisite smell that lingers through your house! I think someone needs to invent one of those glade plug in scents that emulates the scent of fresh baking banana bread! Kind of a genius idea, right?! I’ve had a slice of this bread almost every day since I’ve baked it and I have another 3 ripe bananas in my kitchen to make a second batch with. I think I really love this recipe because of the added coconut that we all know I’m fixated on at the moment! I promise my next recipe will not contain anything even remotely coconut-related. It’s going to be broccoli soup! In a mixing bowl, combine flour, baking powder, and baking soda. In a separate large mixing bowl combine mashed bananas, brown sugar, and vanilla. Add egg whites and mix together until smooth and then add in the oil. Slowly incorporate the flour and combine until moist. Add in the greek yogurt and coconut milk and combine. 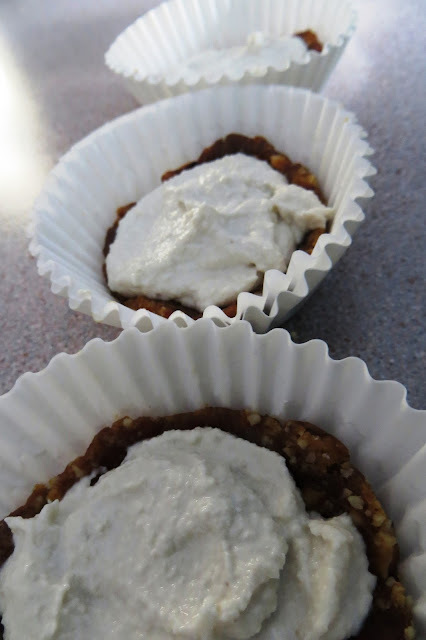 Lastly fold in ½ cup of coconut and walnuts (if using) into batter. Pour into greased 9×5 inch loaf pan. Sprinkle 2 tablespoons of coconut on top. As of lately I have been on a real coconut-kick! I am not sure where this sudden burst of fixation came from but it makes me want to move to a hot sunny island where I can have fresh coconuts every day. Wouldn't that be nice? In my search of anything coconut-flavoured, I've come across the REAL DEAL when it comes to fresh and tasty coconut water. I was lucky enough to receive some bottles of Maverick Brand’s Coco Libre Coconut Water and their new Flavoured Coconut Water with Chia Seeds. Coco Libre’s coconut water is pure, organic coconut water with absolutely no added ingredients. Their water comes from young green coconut’s and each drop delivers refreshing hydration as well as 5 electrolytes K, NA, Mg, CA and P. It is only 40 calories per 8 oz. serving and contains more potassium than a banana! I received bottles of the original coconut water, pineapple coconut water and the 4 flavours of the chia seed coconut water which is cherry apple, raspberry lemonade, strawberry kiwi and blackberry pomegranate. The original coconut water was very authentic tasting; it was basically like drinking right from a fresh cut coconut except that it was cold since I had it in the fridge. It was mild tasting just like real coconut water, not sugary like some of the weird brands I've tried before. It was SUPER refreshing to drink on its own or to use it in place of liquid in a smoothie. Maybe a pineapple, coconut water, mango smoothie? Yum! These chia seed coconut waters are such a great idea because you are getting maximum health benefits from the chia seeds plus the coconut water. You’re also left feeling really full after downing a bottle because the chia seeds absorb up to 12 times its weight in water. These little seeds also contain omega, fibre and calcium so it’s the perfect drink especially for those who like to work out. 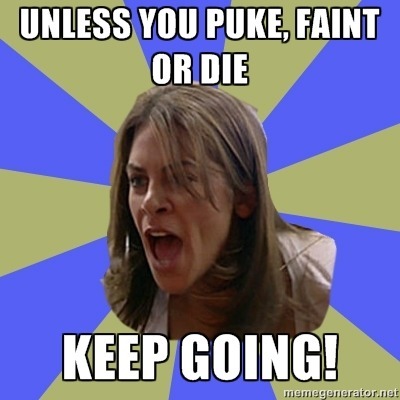 It really gives you that extra energy and hydration that you need for some of those tougher, longer work outs. Of the 4 flavours I have only tried the strawberry kiwi and the raspberry lemonade so far and they both were full of flavour! At first it felt funny in my throat drinking liquid packed with chia seeds but I kind of liked it after awhile. The chia makes the liquid a bit thicker so it’s almost like drinking a thicker more watered down smoothie. It was fruity and satisfying and I literally was full for at least 3 hours after downing one of these. I really love the idea of chia seed drinks so I am excited to have these again as well as discover other chia drinks out there! Thank you Coco Libre for making some damn good coconut water! Happy Sunday Everyone! Today I used my overripe avocados to make something quite special, chocolate avocado muffins! I usually will just make a quick guacamole with ripe avocados but I found this muffin recipe the other day at Kitchen Apparel and really wanted to try it out. 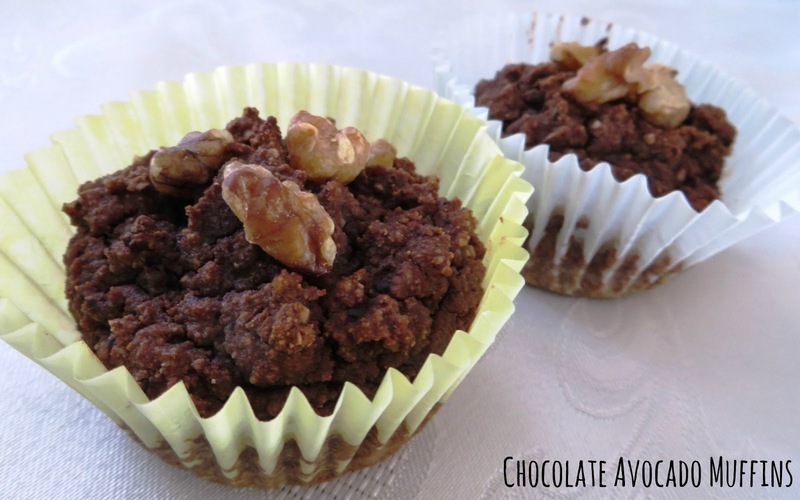 These healthy little muffins contain gluten-free flour and there are no eggs or butter in this making them both vegan and gluten-free friendly. Most of the ingredient list I already had on hand, the only thing I had to pick up from Bulk Barn was the coconut flour and almond meal. It took about 15 minutes to prepare the muffins and another 20 minutes to bake. The batter was easy to whip up but it’s important not to over-mix when combining the wet and dry ingredients. The batter should be light and fluffy! You can top these muffins with any chopped nut or even chocolate chips, or leave them bare. My mom tried the first one and kind of looked at me funny and said “boy these are definitely a healthy muffin”. Meaning they are not SWEET enough for her. I tried one right after her and noticed that the consistency of the muffin is very moist and crumbles apart, which I don’t mind. They tasted very rich in cocoa powder with a hint of maple for sweetness and of course you couldn't taste the avocado in it at all! The richness of the cocoa powder made me want to chug a glass of milk with these, which made for the most perfect satisfying snack. My sister really enjoyed these too as they are a nice change from your regular sugary muffin. She even asked to bring some to work so that she can have it in the morning for breakfast. Being the nice sister that I am, I said yes, even though the recipe only makes 12 muffins and 3 were already GONE! If you’re in the mood for a healthier muffin that is moist and delicate in flavour and rich in heart-healthy omega, then these muffins are just the right thing! In a large bowl, combine all of the wet ingredients. Using a hand mixer, mix on low until smooth. 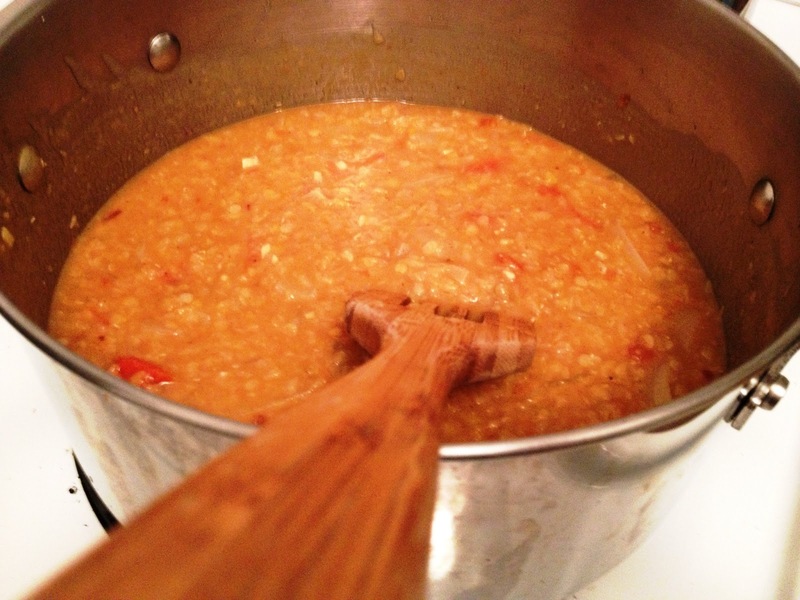 In another large bowl, combine all of the dry ingredients and whisk together until combined. Add the dry ingredients to the wet ingredients and mix on low until combined (do not over mix). Divide batter amongst 12 muffin cups filling up until ¾ full. Sprinkle on your toppings and bake for 20 to 25 minutes or until a toothpick inserted comes out clean. Let them cool on a wire rack before digging in! Happy Valentine’s Day! I haven’t had a chance to make any heart-shaped treats today but I did make a delicious Coconut Cream Pie this weekend! The pie had the most perfect hint of coconut flavour and all the rest was just creamy homemade whipped cream goodness. I totally had 3 servings of this pie, it was impossible not to! The only thing that I messed up on was not letting it chill long enough. It ended up being more like a sloppy pudding pie, but it still tasted fantastic! 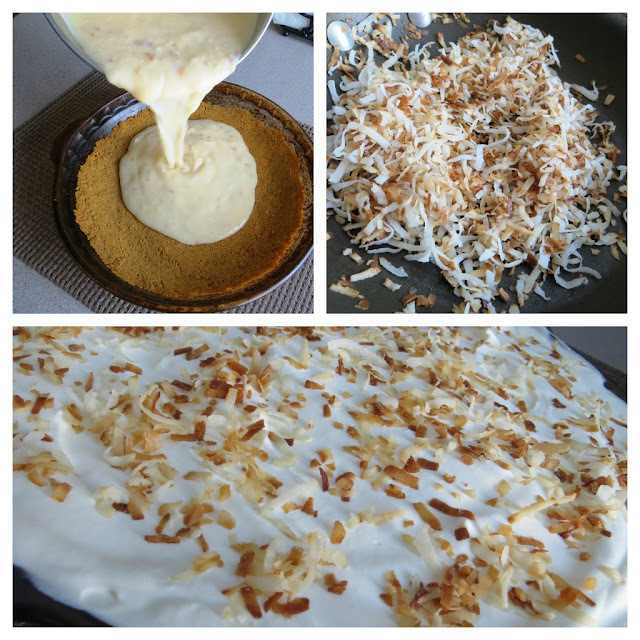 The toasted coconut is an essential, do not skip on this! What are you lovelies doing for Valentine’s Day? Combine graham cracker crumbs and melted butter in a bowl and stir until combined. Pour mixture into a pie dish and press firmly. Bake crust for about 10 minutes and let it cool completely. In a small saucepan over medium heat, combine pudding mix, coconut milk and whole milk and whisk until thick, about 5 minutes. In the bowl of an electric mixer pour the cream and beat on medium for about 3-4 minutes until the cream begins to thicken. Add in the sugar and extract and continue to beat until stiff peaks form. You can do this by hand with a whisk; adjust your beating time (add on another 5-8 minutes). Pour cooled pudding mixture on top of the pie crust and spread evenly with a spatula. Pour the whipped cream on top and spread out evenly. 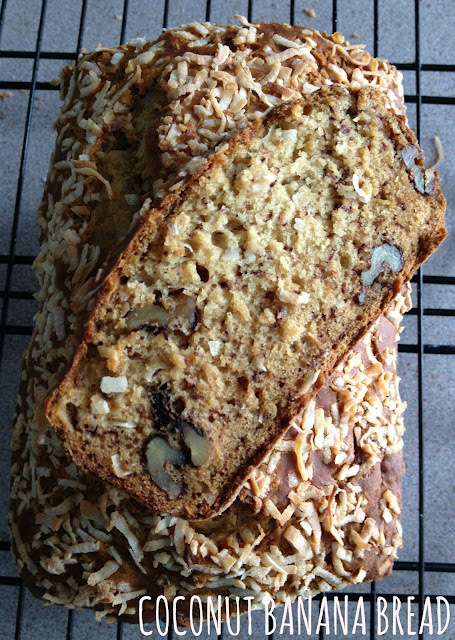 Garnish with toasted coconut and let chill in the fridge for 2 to 3 hours or until firm. Happy Monday Everyone! I am so sleepy from staying up late and watching The Grammy’s. 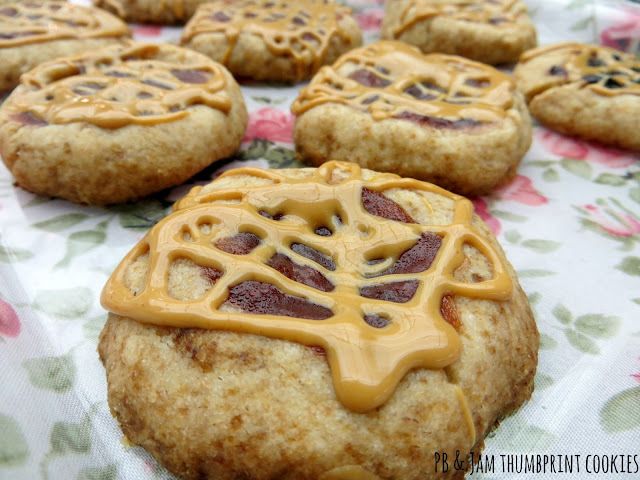 Thankfully I have a large cup of coffee and I'm nibbling on these delicious PB & Jam Thumbprint cookies I made over the weekend using Crofter’s Organic Spread’s. Crofter’s has been around for over 20 years specializing in organic fruit spreads, conserves and jellies and is currently the largest organic jam manufacturer in North America. Owner’s Gerhard and Ghabi Latka founded Crofter’s in 1989 and are passionate about producing high quality spreads using fresh harvested organic fruits and heritage fruit varieties such as Senga Sengana strawberries, Willamette raspberries, and Morello cherries. I like that Crofter’s uses cane sugar in their super fruit and premium spreads and white grape juice concentrate for their just fruit spreads making them a much healthier choice compared to a lot of the other jams out there. I received jar’s of the Apricot, Morello cherry and Strawberry Premium Spreads and the North American Super Fruit Spread which contains wild blueberries, wild cranberries, red grapes and morello cherries aka antioxidant overload! My favourite of the 4 spreads was the strawberry. It was by the far the best strawberry jam I have ever had. 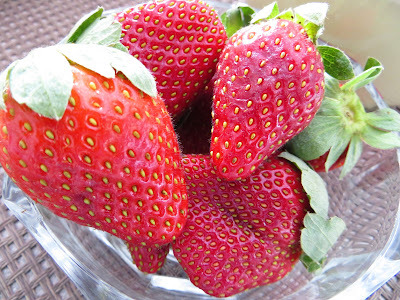 It wasn't too sweet and you could taste the natural flavour of the fruit. 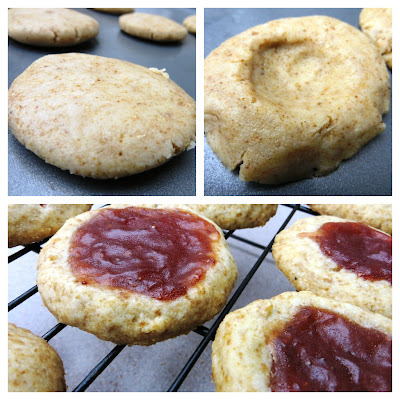 The texture was thick but not too gooey, it was perfect to spread on toast or to use in these Pb & Jam Thumbprint cookies I made. The Superfruit spread was very dark and rich and had a tart taste to it. I could really taste the grape in it which was really nice and the spread was a little less thick than the premium jams but still very spreadable. Try out Crofters: You can try a wide variety of other flavours available at Crofter’s by entering my contest below. Two lucky winners will win 2 vouchers’ each for free jars of Crofter’s Organic Spreads! Contest is open to Canadian and US residents. Use it in a recipe: Crofter's website offers a ton of delicious recipes using their spreads. You can find their recipes here or you can try out my yummy PB & Jam Thumbprint cookies. In a large mixing bowl, mix together butter and sugar until combined and smooth. Slowly incorporate the flour and mix well until combined. Roll dough into small balls and flatten out onto a greased baking sheet. If the mixture is too crumbly just add a bit more butter and roll the dough into your hands to warm it up. 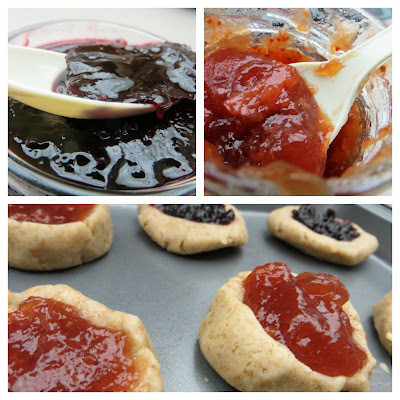 Press your thumb into the centre of each flattened cookie and fill it with the jam. Bake for 12 to 15 minutes or until edges are starting to brown. Let cool on a wire rack as you prepare the peanut butter/oil mixture. In a small microwave safe bowl, heat peanut butter for 15 seconds or until melted. Add in the olive oil and stir. Drizzle the warm peanut butter over the cookies using the edge of a knife or fork. Let the peanut butter cool before digging into these incredibly addictive cookies!